Some of the best horse and rider combinations from across North America made their way down the centre line today at the Bromont CIC Three Day Event. Leaders for all six divisions going into show jumping had excellent dressage tests, but one combination stood out from the rest. Marilyn Little (USA) who is here as part of the final US Team mandatory outing ahead of the FEI World Equestrian Games in Tryon, North Carolina next month had a fabulous test on RF Scandalous (Kitty), the 13 year old Oldenburg mare owned by Jacqueline Mars with Phoebe and Michael Manders. How fabulous you ask? 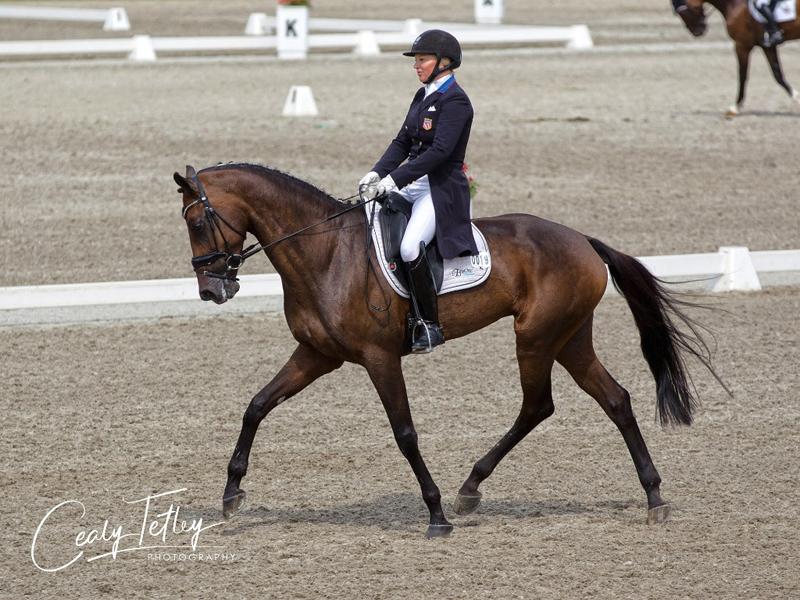 EquiRatings confirmed to us that Marilyn and Kitty’s score of 19.90 (29.90 in former scoring method) is the second best three-star dressage score in North America this decade, bested only by Phillip Dutton and Mystery Whisper’s score of 18.60 (27.90 in former scoring method) at Red Hills in 2012. Certainly one to watch this weekend Marilyn Little last rode at Bromont in 2015 where she won both on RF Demeter in the CCI3* and RF Overdressed in the CCI2*. Ireland’s Michael Nolan leads in the CIC1* U25 with a score of 27.80 on the 6 year old Thoroughbred gelding Bad Moon Rising owned by Kara Andrew. A score of 23.40 following dressage gives Matthew Brown (USA) riding Anna Honeycutt’s Fernhill Chico in the CIC1* going in to Saturday morning show jumping. The CIC2* saw two excellent dressage tests from Canadian Team member Jessica Phoenix with Pavarotti and Bentleys Best to land in first and second respectively. Phoenixville, PA based, Amanda Beale Clement and BE Kilgoric Felix lead the Training Young Rider division with a score of 26.90. Open Training which was the final of the levels to finish up dressage and the only ones to compete in the light rain that arrived this afternoon saw Lauren Kieffer (USA) and Get Gaudi rise to the occasion on a perfectly respectable score of 22.10. Show Jumping begins tomorrow morning promptly at 8:30am with Phillip Dutton (USA) going first in the CIC3* on Z over a Marc Donovan-designed course. Bromont CIC takes place near the charming village of Bromont, which is within easy driving distance of Montreal, Quebec and Burlington, Vermont. This scenic area offers great dining, shopping, entertainment, and golf options. The Bromont Olympic Equestrian Park, which hosted the equestrian events of the 1976 Montreal Olympic Games, has in recent years undergone massive upgrades and is considered one of the best in North America. The Bromont CIC Three Day Event is made possible in part through a contribution from the Government of Canada. The Bromont organizing committee also wishes to thank the Gouvernement du Québec, Ministère de l’Éducation et de l’Enseignement Supérieur, and the City of Bromont for their support of this year’s event. Links to results and start times are available here.